Do your privilege management practices stack up to NERC CIP requirements? Energy and utility companies in the United States must comply with cyber security requirements outlined in the North American Electric Reliability Corporation (NERC) Critical Infrastructure Protection (CIP) plan. 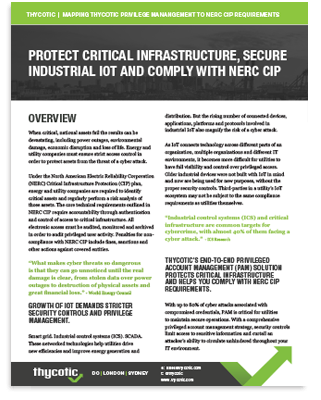 NERC CIP includes strict access control requirements over utility generation and distribution systems to protect critical infrastructure from external cyber threats as well as malicious insiders. All electronic access must be logged, monitored and archived in order to audit privileged user activity. Require inbound and outbound access permissions, including the reason for granting access, and deny all other access by default. Require multi-factor authentication for all Interactive Remote Access sessions. Deploy method(s) to deter, detect, or prevent malicious code. Generate alerts for security events, at a minimum: detected malicious code and detected failure of event logging. Enforce authentication of interactive user access. Identify individuals who have authorized access to shared accounts. Change known default passwords.